Simon Tetlow, deputy head gardener at the famous Tatton Park Gardens. 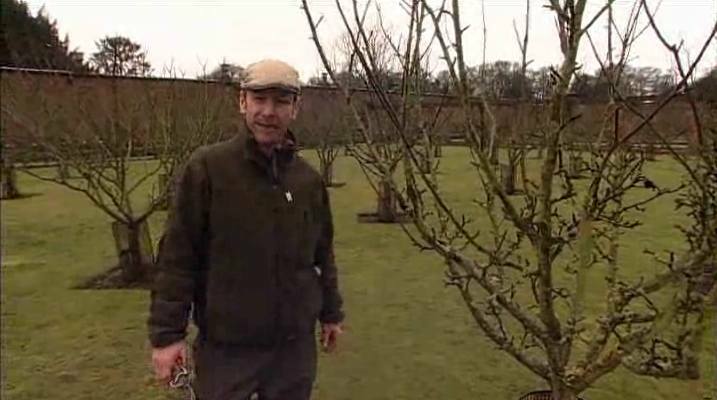 shows us the correct method for winter pruning a fruit tree. In this case he is pruning an apple tree which is in a goblet shape, allowing for good clean fruit that is easy to get at and pick. Good pruning helps reduce and prevent disease like canker, ensures good pollination for a larger crop and proper ripening of that crop. Winter pruning promotes growth so don’t hold back because your tree is young. You need to start shaping from the first growing season. Pruning is one of the most skilled jobs in the garden. You need to be ruthless and bold, know where to cut and not be afraid to cut yet restrained and careful. The skills required for a good surgeon, so I’m told. The important thing is to keep the desired end result in mind: A healthy tree with plenty of fruiting spurs producing lots of good quality fruits. Simon covers in detail all the different points he is aiming to cover with each cut, always keeping in mind how the tree will grow from his pruning. You might want to make notes as he explains winter pruning. Don’t forget you can stop and start the video, rewind and replay as often as you like. Love this video…Simon Tetlow should be presenting on TV. Does anyone have the follow up summer pruning video that Simon did?